A poignant, moving illustrated account of Hollywood's most famous dog follows the adventures of Terry, cairn terrier who played Toto on The Wizard of Oz. WILLARD CARROLL owns the world's largest collection of Wizard of Oz memora-bilia, which is documented in his book 100 Years of Oz (Stewart, Tabori & Chang). He is the writer and director of the feature films Playing by Heart (Miramax) and Tom's Midnight Garden. He is also the producer and writer of the animated film series The Brave Little Toaster. "I don't mean this to sound full of myself but this Wizard of Oz story? It's all about me!!! I'M IN ALMOST EVERY SCENE IN THE PICTURE!!!" A leaf from Judy Garland's long lost diary? Secret tapes of a Munchkin? No, it's the original diary of Terry, the dog who played Toto in the classic 1939 MGM film. Writing in plain, even humble prose (although she describes her part as vital and her performance as flawless, she understands that Judy Garland was the star of the film), Terry also reveals the grueling before-scenes enemas, snafus on the set and the great difficulty of playing a scene with flying monkeys. 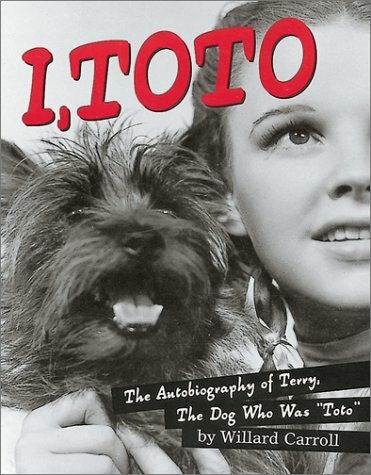 A curious cross between Oz trivia, a parody and a chronicle of Terry's actual career (she made 14 movies and worked with Shirley Temple, Spencer Tracy and Joan Crawford), this entertaining and fanciful "diary" also reveals intriguing facts about the economics and mechanics of training animals for films and, specifically, the career of Carl Spitz, Terry's manager and one of the most respected animal trainers in the business. While Carroll, a Wizard of Oz fan, is not as overtly clever or deliciously mean-spirited as Patrick Dennis, the author of Little Me, the classic 1961 parody of star autobiographies, he isn't debilitatingly fawning, either. This fun little tome should both amuse and please dog lovers, as well as fans of Oz and collectors of Hollywood arcana.